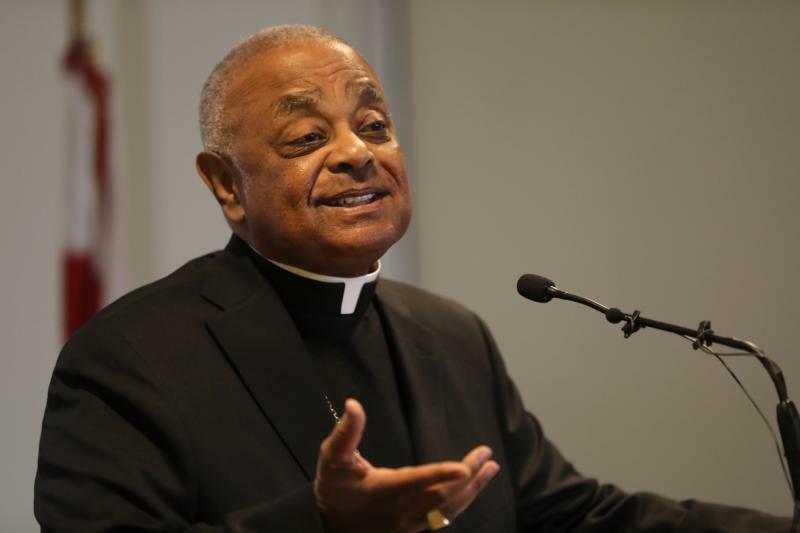 WASHINGTON (CNS) — The following are quotes on a variety of topics from Archbishop Wilton D. Gregory, named to head the Archdiocese of Washington April 4 by Pope Francis. They were compiled by the Catholic Standard, archdiocesan newspaper of Washington, from Catholic News Service reports, The Georgia Bulletin, newspaper of the Archdiocese of Atlanta, and the website of the Atlanta Archdiocese, which Archbishop Gregory had headed since 2005. “There is significant ecumenical and interfaith agreement that the death penalty needs a much more restricted application. The pope has cautioned us that its employment is never validated. What is most difficult for some people to admit is that these inmates, in spite of the horrendous acts of violence of which they may be guilty, are still human beings. The violence that they may well have inflicted on others does not rob them of their human dignity. “This is the very same truth that underpins the dignity of nascent life within the womb. Infants waiting to be born are also worthy of the reverence that all human life enjoys. Just as there are people who do not see how violent people can still have their humanity acknowledged, there are those who fail to accept the human dignity of those just waiting to be born. The people who reject the humanity of the violent criminal assert that they are not worthy of human dignity because they forfeited innocence by committing crimes — unlike those innocently awaiting birth. But our human dignity does not rest in our innocence, but on the fact that we all have been created by God himself. Human dignity is never dependent upon race, age, social class, legal immigration status, criminal background or health.” — From Archbishop Gregory’s Jan. 10, 2019, “What I Have Seen and Heard” column for The Georgia Bulletin. “We must teach our children the ways of peace, the pattern of respecting and loving others as Jesus has commanded us. This is more than the mere tolerance of the differences of other people. It is the positive acceptance of people of other faiths, races and cultures. I have repeatedly admonished our youngsters at confirmation that they must never view people who are different from them as enemies, rivals or somehow inferior. Our youngsters are subjected to so much violence — in movies, in video games, in cyberspace and even in their streets.” — From Archbishop Gregory’s March 21, 2019, “What I Have Seen and Heard” column for The Georgia Bulletin. “We are so richly blessed here in the Archdiocese of Atlanta by the life and faith of our Hispanic sisters and brothers who are present throughout the 69 counties of north and central Georgia. They not only add to our growing population, but they bring us a vision of the Lord’s presence in his church that is invigorating and buoyant. Their devotional life, their family life and their deep Catholic faith all make us a much more vibrant church. “Each community that is a part of this local church has gifts to offer, and each one does so willingly and generously every day…” From Archbishop Gregory’s Sept. 20, 2018, “What I Have Seen and Heard” column for The Georgia Bulletin. “Every court decision is limited in what it can achieve; again, this one is no exception. It does not change the biological differences between male and female human beings or the requirements for the generation of human life, which still demands the participation of both. It does not change the Catholic Church’s teaching regarding the sacrament of matrimony, which beautifully joins a man and woman in a loving union that is permanent in commitment and open to God’s blessing of precious new life. “Even as we redesign Catholic schools in many areas that have seen significant demographic shifts in population and establish new schools for growing communities, we cannot lose heart or cease to focus on the mission that comes to us from apostolic times — to proclaim Christ risen from the dead… If we look only at yesterday and at the models and triumphs we enjoyed, we may not be able to see the great possibilities that tomorrow holds for us.” — From Archbishop Gregory’s homily at the opening Mass at the 2006 convention of the National Catholic Educational Association, held in Atlanta. “The Holy Father wants us all to take seriously the issues that face our planet — not only from an economic perspective, but out of genuine ethical concern for all of the people with whom we share it. Pope Francis calls us to embrace an integral ecology that brings every dimension of our political, social, financial, ecumenical and scientific worlds together in serious dialogue. “Priests do not impart a mundane service or deliver a product that they themselves do not use and in which they do not believe. Priests literally market a spiritual joy that they themselves depend upon and in which they find spiritual strength in their love for the Lord Jesus.” — Archbishop Gregory in a talk at a symposium on the priesthood held in 2011 at The Catholic University of America.